Details SciPy India is a conference providing opportunities to spread the use of the Python programming language in the Scientific Computing community in India. 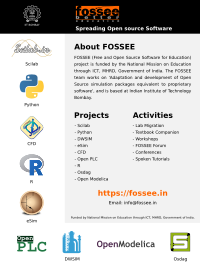 It provides a unique opportunity to interact with the "Who's who" of the Python for Scientific Computing fraternity and learn, understand, participate, and contribute to Scientific Computing using Python. One of the goals of the conference is to combine education, engineering, and science with computing through the medium of Python.